- Session on basic safety & safety reviews in process industry and its importance. - Coaching and Mentoring young engineers from industries. - LNG Concept and Understanding. Training and Trade Test Centre established in 8000 sq/ft. for Theoretical & Practical knowledge with Modern Instruments & Equipments so that to impart skilled training which is provided by Experienced Foreign Trained Staff. Learn the art of making effective presentations at interviews, corporate, business or social meetings where making the right impression matters most to you & your Career. Present yourself with confidence with the right kind of preparation. Communicate to be understood accepted. 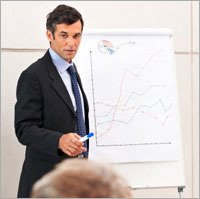 Leaders in business are expected to have highest standards of presentation skills. Overcoming the fear of speaking in front of people and getting your ideas across, through tools available.